Many times when we mention the terms DNS, domain name registration or web hosting, potential and existing clients’ eyes glaze over, heart rates increase and beads of sweat well up on their foreheads. Because we care about your comfort and welfare, we’ve rounded up some details to help explain the whole dealio in less stressful terms. Domain names are part of the URL that is used to identify where your webpage is on the Internet. Each domain name is unique, that’s why it’s one of the first things we ask clients to set up if they don’t have one. When selecting a domain name, make sure it’s related to your business, memorable and most importantly… available. A quick check on whois.com will reveal what names are up for grabs or not. If a domain name is available, then it’s important to claim it by registering it to your personal or company name. Once you’ve selected a domain name and confirmed it is available, you need to register it. Registering it assures that once a customer types in your URL it will take them to your website and not somewhere else! There are several domain name registrars available who will be more than happy to manage your sparkly new web address. Be sure to explore your options and select a service that is accredited within the country you are located in. Fees vary depending on what company and service package you select. 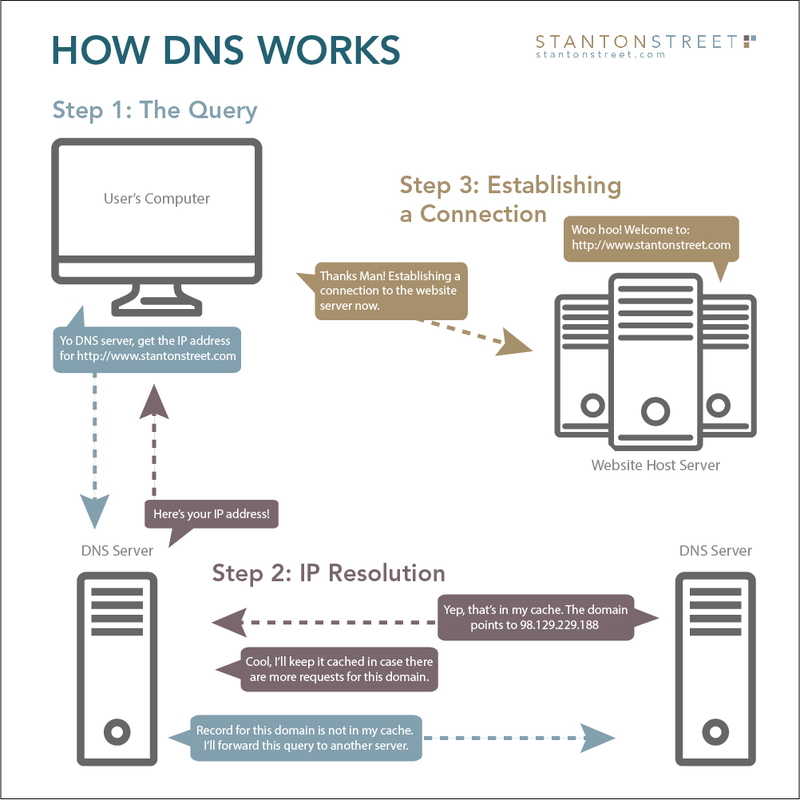 Once your domain name is selected and registered, it will then be translated into an IP address per the Domain Name System, or DNS. This happens because computers and servers don’t speak human and need to understand commands in order to exchange files. As a result, http://www.stantonstreet.com translates to: 98.129.229.188. Web hosting is a necessity because without it, a website wouldn’t exist. This is where all of your website files will be stored and managed. A majority of the time, a web developer can host your website and all of the associated files on their server. Since a website is renting space on a server, providers charge for that space. Those fees go toward server maintenance and updates. See? That wasn’t bad. Best part is that we can handle all of this for you! We can feel your stress levels decreasing already. Start the process by filling out our contact form or giving us a call at (915) 351-8440. The Fountains at Farah’s New Website is Overflowing with Awesomeness!